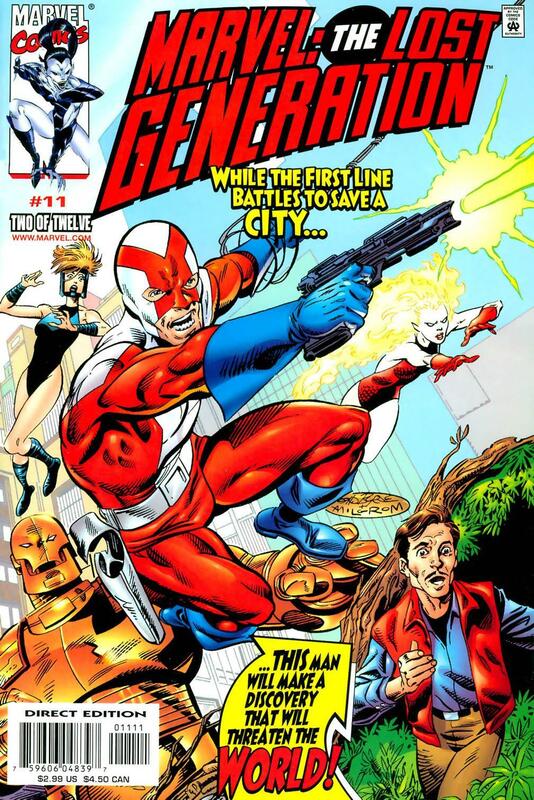 I was mentally sifting through my superhero comics from the 1990s and early 2000s for Tom Spurgeon's latest "Five for Friday" and I recalled a mini-series from 2000 called Marvel: The Lost Generation by Roger Stern and John Byrne. The basic premise is that it fills in the gaps between the end of World War II and the introduction of the Fantastic Four. When the FF first debuted, that was only a period of about 15 years. But sometime in the 1970s or '80s, it kind of came to be understood that the Fantastic Four had only been around for ten years as they were on a different time-scale than the real world. And then sometime, I think, in the late 1980s or early 1990s, that got changed to that the FF have ALWAYS been around for about ten years and WILL CONTINUE to always have been around about ten years. More of a sliding time-scale. So now, in 2012, the team would have debuted almost 60 years after WWII ended! So what happened in those six decades? Enter Marvel: The Lost Generation. The series was designed specifically around the idea of addressing not only those "missing" (at the time) five decades, but also any more time that might occur in the future. Each of the twelve issues hinted at what had been going on, but was left vague in terms of dates relative to just about everything else. A character who was a sidekick in one issue might be a grown hero in his own right in the next with no explicit explanation of what happened in between. Some characters would just stop appearing, and others would make obtuse allusions to their death/disappearance. There were a few characters who were effectively immortal that kept popping up, as did a time-travelling historian. The Lost Generation issues were numbered backwards. It debuted with #12 and counted down to #1. The stories, while all connected, are independent by design so the series can read either direction just as well. I talked to Stern shortly before the series came out, and he had argued to some of the folks at Marvel that it would be a benefit to do it that way, since they could theoretically produced two trade paperbacks from the series, one running in each direction. However, we're over a decade out now and it's never been reprinted in any form. I don't believe any of the characters that were introduced have been used since then either. Thematically, it seems to go very much against the grain of what Marvel is trying to do with their IPs now so I wouldn't expect to see a collected edition any time soon. 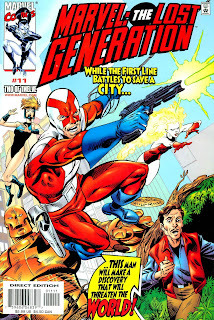 I'm sure one of the reasons I liked the book was because it felt very much like the type of comics I grew up on in the late '70s and early '80s. Not surprising given the creators involved. But since it was almost entirely new characters in a very different type of story than what I grew up with, I'm sure my appreciation for it isn't strictly nostalgic. I may just have to dig that series out again to re-read it. In both directions! It probably is thematically out of step with Marvel of today, though the series' lack of a collected edition may have as much to do with its being forgotten. Marvel published "Spider-Man: The Complete Clone Saga Epic," after all, which story is definitely not forgotten but, on the other hand, probably at least as much of a "no-go" relative to current story directions. I loved M:TLG. I didn't buy it when it came out, but a couple of years later managed to con my dealer into knocking €5 off of the bundle's price. Regrettably, I think Matt K is right. M:TLG is like Schrodinger's Cat. I remember it fondly when I think about it, but I usually just don't think about it. Since it had no impact on the rest of the MU, I doubt it'll be more than an interesting anecdote when fans are researching old material. Kind of amazing that none of the characters have appeared in any book since (except some minor appearances in Marvel book's written by John Byrne). But they apparently all died fighting the Skrulls -- of course, when has that ever stopped a super hero from returning.